The first Test match to be played in this country on a day/night basis, from two until nine o'clock rather than the traditional eleven o'clock until six, began between England and the West Indies at Edgbaston, Birmingham, yesterday, with a pink rather than a red cricket ball being used, apparently so as to be more visible to the batsmen under the floodlights. In the United States, baseball games have been played at night under floodlights since the 1930's, but given the number of games in the regular season there are still plenty of day games for fans to watch on TV or go to. 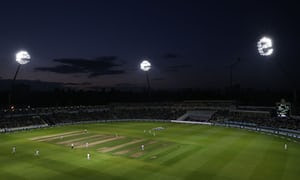 Day/night games are also routinely played in Twenty20 cricket. Although I'm not a fan of that form of the game, with its emphasis on slogging and slightly predictable run chases in the final overs, I think Test cricket played in the later hours of the day is a good idea, allowing people to travel to the ground straight from work and still see most of the first innings and that, especially in hotter countries like those of the Indian sub-continent, the cooler temperatures then will make it more comfortable for both players and spectators, but I predict, and hope, that most Test matches will still be played in the hours of daylight.